Orleans International is an industry leader in creating timeless and original furniture for the luxury homes of the world. As one of the world's largest privately-owned fine furniture companies, Orleans International is committed to building the finest custom furniture combined with the relentless pursuit of perfection and an unwavering dedication to original design, craftsmanship, and using the finest material. Orleans International employs an international team of designers and artisans dedicated to fashioning exquisite and unique furniture. Our designers and artisans harmoniously fuse old-world tradition of elegance and luxury and combining modern furniture construction. From our studio in California, our designers travel the world for inspiring designs and look to classical homes in creating original furniture that will last this generation and beyond. By assembling an acclaimed team of designers and featuring our own manufacturing facilities, we offer what no other manufacturer can with our exquisite detailing, wood & fabric selections, veneer options, custom quality hardware and using the highest construction techniques in the industry. All woods are treated through a state-of-the-art dry kiln process. Our attention to detail carries over to all of our hand applied custom finishes and carpentry. Our artisans stain, pad, rub, antique, highlight, and shade all by hand. 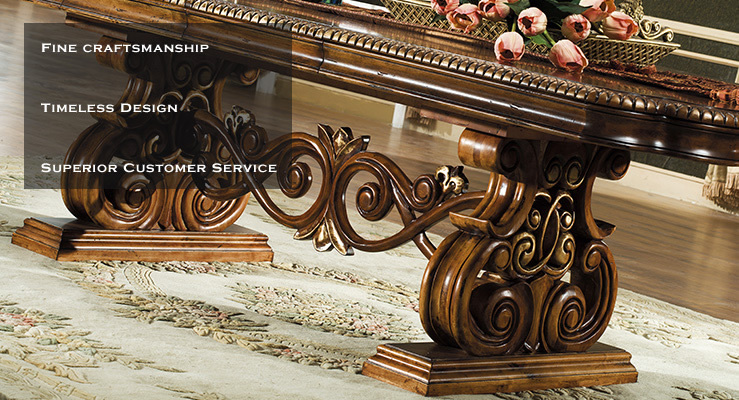 The result is finely-crafted furniture befitting of luxurious homes. Further defining each individual piece is our ability to customize. We offer a mass assortment of top quality fabric in colors, textures and types to select from and a fine attention to the tailoring details. Floral patterns are centered, stripes are matched, and stitches are carefully sewn. Today Orleans International is an industry leader well known for its innovative design and world-class quality. Enduring tradition, superior craftsmanship, an unshakeable philosophy of excellence—these are our founding principle and our commitment to you.